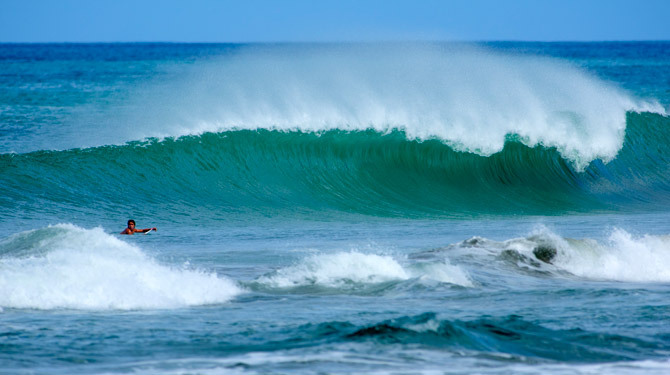 Amazing surfing continued during Day 3 of the DAKINE ISA World Junior Surfing Championship Presented by Billabong as Nicaragua’s offshore wind prevailed all day long. Competition intensified as the first Repechage Rounds took place today. This is a do-or-die round, if a surfer gets 3rd or 4th place, the athlete is out of the contest. Today showcased Qualifying and Repechage rounds of the world’s best under-18 and under-16 Boys and Girls with great waves in the 3-5ft range with occasional bigger sets. Australia’s Stephanie Single and Kristen Ogden led the Girls Under-18. Single earned 15.90, followed by her teammate Ogden with 14.67, the highest total heat scores of the Round. Single defeated Keshia Eyre (POR, 7.83), Camila Kemp (POR, 6.33) and Paula Duarte (CRC, 0.77). Ogden followed in her teammate’s footsteps dominating her heat defeating Hinako Kurokawa (JPN, 7.07), Leilani McGonagle (CRC, 5.36) and Iliana Aguirre (ECU, 2.23). In the Girl’s Under-16, the stand out of the day was Holly Wawn from Australia, posting a total heat score of 16.00 against her teammate Isabella Nichols (AUS, 13.16), Jodie de Armas Tracy (GER, 3.10) and Teresa Bonvalot (POR, 2.97). At the same time, the first Repechage Rounds of the Boys Under-18 and Under-16 was taking place at the second podium. Germany’s Arne Bergwinkl was the best performer in the Boys under-18 Repechage 1. He posted a total of 13.00 points defeating Irons Burgos (ECU, 6.33), Giancarlo Marin (VEN, 6.06) and the local surfer Yuber Martínez (NIC, 5.24). Bergwinkl surfed again in Repechage 2 and is still in the competition after advancing in second place. In the Boys under-18, Colin Moran from Team USA, earned 16.06 defeating Sean Kettle (NZL, 11.40), Jose Luis Ramos (SAL, 7.57), Jorge Soto (CHI, 3.33). With the day’s highest total heat score, France’s Nomme Mignot earned 17.83 dominating Jorge Alejandro Rivas (SAL, 6.27), Malakai Martinez (CRI, 6.10), and Sebastian Oliva (CHI, 4.67). The 2013 DAKINE ISA World Junior Surfing Championship resumes Wednesday at 7:40am with The Morning Show hosted by Chris Ernst, and with guests from Team Germany and Team Japan.